The Great Park of Los Angeles. This proposal reimagines a restored Elysian Park by aggregating and stitching the various green fragments to form a vast regional park network which connects the LA River, the Arroyo Seco, the Cornfields, Elysian Park, and the Dodger Stadium Parking Lot with the surrounding urban neighborhood and reappropriates and transforms lands taken through eminent domain as public accessible space. 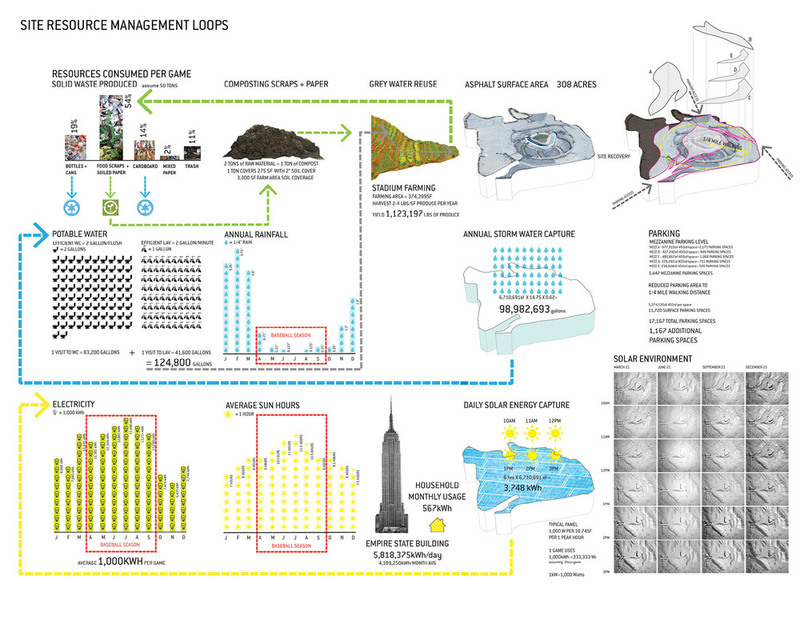 A metabolic landscape is proposed which makes Dodger Stadium an active partner, creating a synergistic landscape where environmental systems and stadium resource management become the same dynamic landscape. The demarcation between Elysian Park and the Stadium is blurred by capping the main access road as a wild native field which gently slopes towards the Stadium. The surrounding hills are reconstructed close to the original topography which reduces the footprint of asphalt parking. The remaining asphalt surface is covered by a deck which supports the Filtration Park, Compost Park, Solar Farm, Stadium Farm, and Urban Room Terraces. Parking mezzanines under the deck maintain the parking count. The reconstructed hills are forested with 13 hectares of oak trees representing a future biomass and energy potential as well as for carbon sequestration. The hills are shaped to capture storm water which is cleansed through the Filtration Park and Lower Fountain Plaza before being stored in cisterns underneath the Stadium Plaza Terraces. Stadium grey water is recycled to irrigate the Stadium Farming Terraces and Urban Room Botanical Gardens. The harvest yield from Stadium Farming supports the stadium’s food demands and surrounding community. Food waste and paper scraps are composted in the Compost Park for stadium farming. The Solar Farm produces enough electricity in two days to support one game. Excess electricity supports the adjacent TOD development. A lightrail on Sunset Boulevard connects the Stadium to Union Station and to the Redline, reducing the demands on road infrastructure. 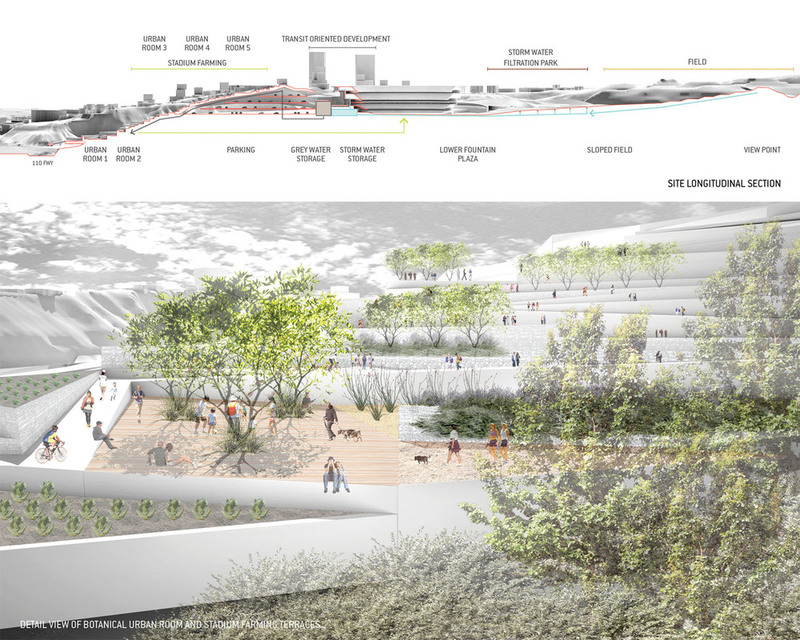 The path from the existing Goldline station is reinforced with paving through the existing pedestrian courtyards that connect to the Lower Park, over the 110 freeway land bridge, and through the Stadium Farming Terraces and Urban Room Botanical Gardens. A site, once fenced off, is no longer private; it is openly accessible and given back to the people.